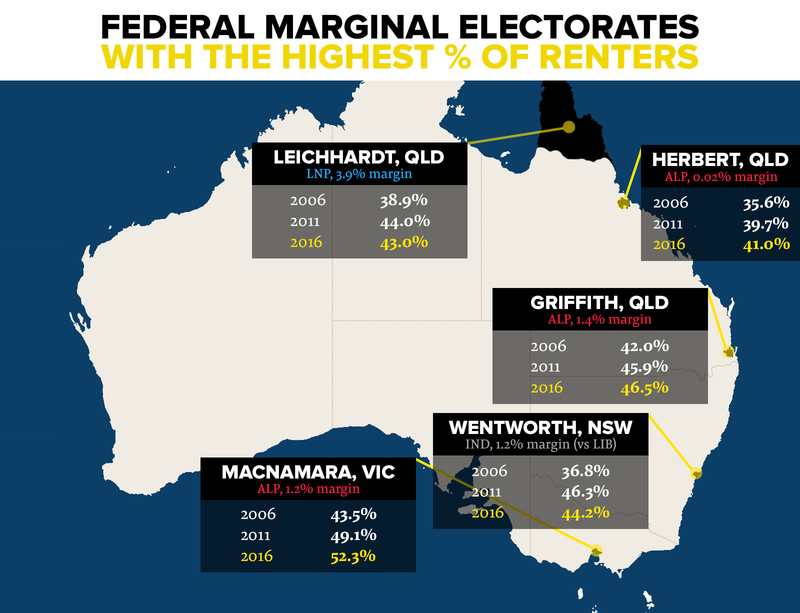 Renters are making up an increasing chunk of the population of marginal electorates across Australia, signalling their growing political power. Since 2001, the share of Australian homes that are rented, rather than owned, by their occupants has risen from 26.3% to 30.9%. But those nationwide figures don’t tell the whole story. Where those renters live matters. Because marginal electorates are likely to decide who forms government at the next election, the population of renters in those seats is a particularly useful indication of how much political influence they could have. The more renters in these tight-race seats, the likelier it is that political parties will woo them with policies designed to make renting easier or more affordable. BuzzFeed News crunched the numbers at both the federal and state/territory level, looking at data from the last three censuses, to find out how much political power renters could wield. In most (36 out of 52) marginal federal seats, the proportion of renters grew between the 2011 and 2016 censuses. In all but three of those 52 seats, the proportion of rented properties increased between 2006 and 2016. Electorates at the state and territory level are also important to consider, because it’s at that level that the basic rules that govern renting are legislated. The numbers of renters in those marginal electorates are also growing, with some sailing past the 50% mark, and particularly strong numbers in inner-city electorates. 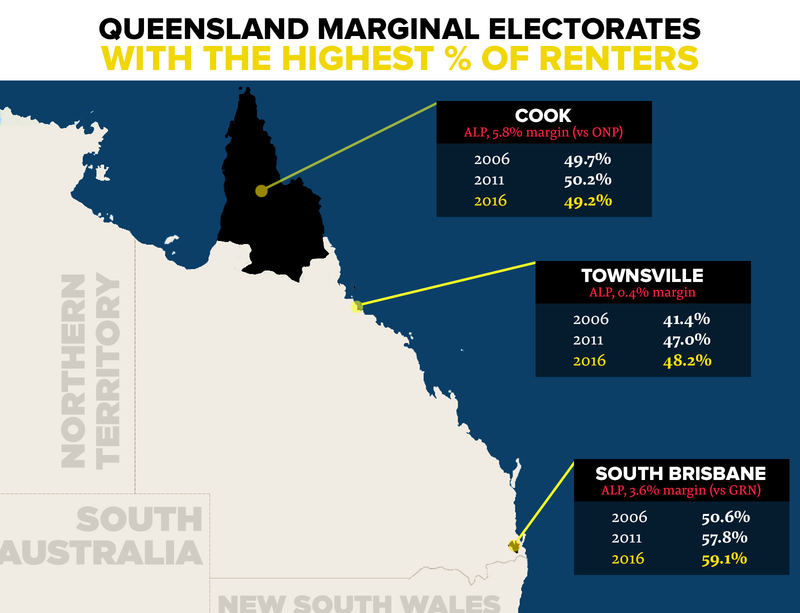 In Queensland, NSW, Victoria, South Australia, and the Northern Territory, a majority of marginal electorates saw renting numbers increase between the last two censuses. Even shy of reaching a majority in key seats, the number of renters could still be enough to be politically significant. “For the renters bloc to become an effective one and election-changing, you don’t need every renter to vote the same way, you just need enough to swing the seat,” senior policy officer at Tenants NSW Leo Patterson Ross, who is also a spokesperson for the National Association of Tenants Organisations, told BuzzFeed News. “I think there is pressure building and it will come in particular seats where the issues are more obvious,” Patterson Ross said. 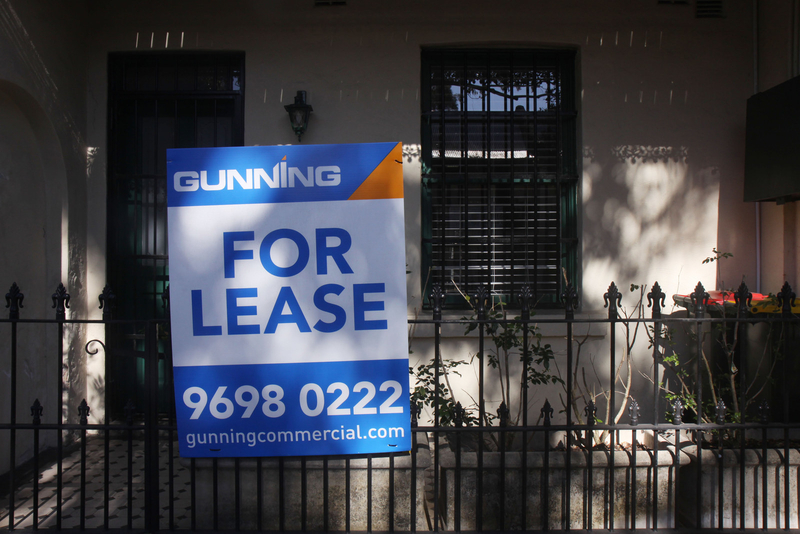 As evidence of that pressure, Patterson Ross points to recent changes to NSW’s renting laws. A statutory review of the Residential Tenancies Act brought it on the legislative agenda. But while the eventual changes stopped far short of the Victorian Labor government’s reforms passed a few months earlier, the NSW Coalition government devised amendments independently of the review that would improve renters’ lot, such as making it easier for tenants to make minor alterations to their homes. “It was clear that they were aware they had to respond to the growing demands for a fair renting system,” Patterson Ross said. So if renters are growing in power, which way are they likely to vote? At the moment, it’s not clear. A national YouGov Galaxy poll conducted in February 2018 suggested that a significant number of renters are generally undecided voters. Almost a third (32%) said they supported Labor, while 19% supported the Coalition. One fifth responded “don’t know” when asked which party they support – which was more undecideds than among homeowners (10% of those who own their home outright and 14% who have a mortgage responded “don’t know”). Although it was a conservative government that reformed NSW’s laws last year, the wave of reform and renter-friendly promises that has swept through the states and territories recently has largely been led by Labor governments. And Greens like NSW’s Jenny Leong – who comfortably beat Labor to win the NSW seat of Newtown at the last election – have made renters’ rights a crucial part of their platform. Patterson Ross argues that Australian renters often don’t vote with renting issues top of mind, because they don’t know that things can be different. “People don’t have a clear understanding of what renting can be, rather than what it is,” he said. That could change with campaigns like Make Renting Fair, a multi-state campaign fighting no-grounds evictions, and as jurisdictions like Victoria take unprecedented action to strengthen renters’ rights. “If people are feeling unstable in their home and they become aware that it’s because of the way that we’re currently doing renting, housing and planning and so on, they will increasingly want to see political parties taking action on that,” said Patterson Ross. The increasing awareness that renting is a political issue, and their growing numbers, mean renters are an electoral cohort that’s up for grabs. “There isn’t a coherent bloc at the moment and that actually means there’s an opportunity for all sides of politics to win this debate,” said Patterson Ross. “Anyone can be the party of the renters. Here’s a closer look at the numbers in marginal electorates. Note that the numbers are approximate in some cases, because electoral boundaries have changed since the censuses were taken. As well, the census doesn’t measure the exact number of renters, but the number of dwellings that are rental properties. The census also does not count the number of investors/landlords – the most likely cohort to be opposed to renter-friendly policies – so it is not possible to compare the numbers. On the national level, conversations about housing have tended to focus on investors and home ownership. But with a federal election looming, the major parties are busy trying to win every vote. Labor has courted renters by promising to spend $6.6 billion over a decade to subsidise new homes to be built and offered at below-market rent – a plan they’ve argued could mean the a family paying the national average weekly rent of $462 could save $92 a week. Meanwhile, the Coalition is arguing strongly that Labor’s plan to wind back negative gearing will raise rents. But that policy, designed to make it easier for first home buyers to enter the market, is likely to appeal to those renters who aspire to home ownership. Of the 52 marginal seats that will be fought over in the coming months, the proportion of rental dwellings increased in 36 of them between the 2011 and 2016 censuses, and in all but three of them between the 2006 and 2016 censuses. In a number of ultra-marginal seats – held by a margin of 1% or less – renters make up a bloc worth reckoning with. The most marginal seat of the country, Queensland’s Herbert, is held by Labor’s Cathy O’Toole by just 0.02%. There, renters make up 41% of households – far above the national average. And in Queensland’s Capricornia, Forde, and Flynn over one third of dwellings are rentals (33.4%, 34.5% and 33.8%). In those seats, Labor only needs a small swing to take them off their Liberal National members, Michelle Landry, Bert van Manen and Ken O’Dowd. Renters are particularly powerful in the seats of Macnamara (formerly Melbourne Ports, in Melbourne’s inner-city), in which 52.3% of households are rentals, Griffith in inner-city Brisbane (46.5%), and Sydney’s Wentworth (44.2%). NSW’s next election is just under three months away. The proportion of householders that rented in 2016 was just above the national average, at 31.8%. 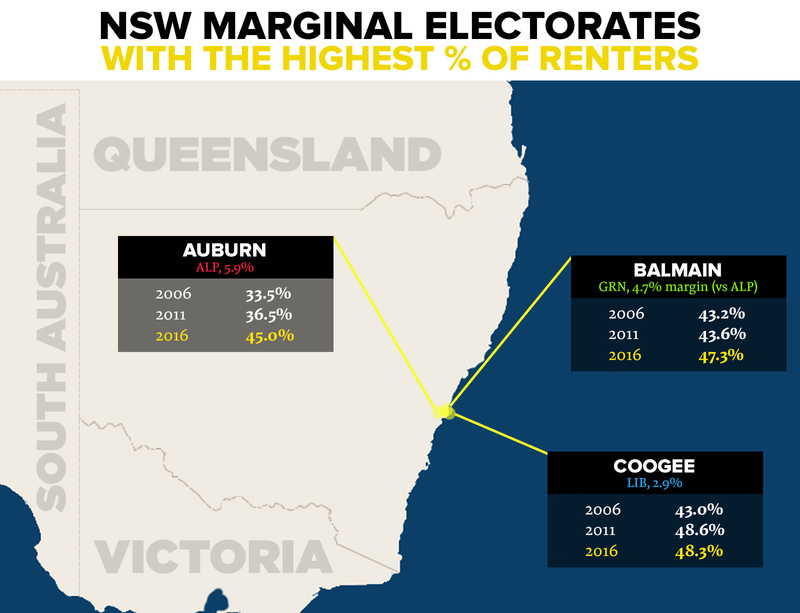 Renters are approaching a majority in Coogee (48.3%), Balmain (47.3%) and Auburn (45.0%). In 12 of the 17 marginal electorates, the proportion increased between 2011 and 2016. In all but three, the proportion of rental dwellings increased between the 2006 and 2016 censuses. That increase in renting is particularly steep in some electorates – like Gosford (jumping from 23.5% to 33.4%), Granville (35.3% to 43.9%) and Auburn (33.5% to 45.0%). The NT has an unusually high concentration of rental properties. Renters have long been a significant chunk of the population, reaching 50.3% of households in 2016. 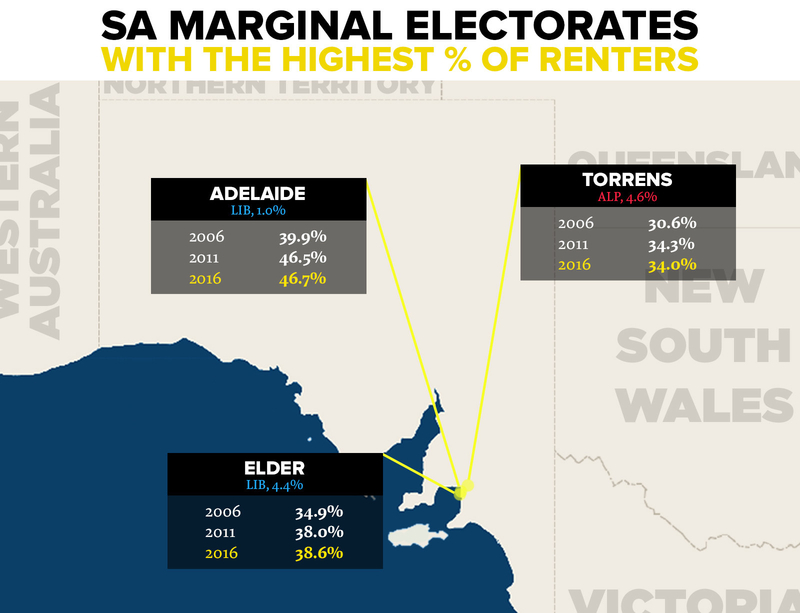 The numbers of renters increased in all but two of the territory’s marginal electorates between 2006 and 2011, and are above the national average in every marginal seat. But none of that has resulted in stronger renter protections. In fact, NT residents may enjoy the weakest renters’ rights in Australia. Reasons for that may be that it doesn’t have a tenants’ union, that its residents are geographically spread out, and that many renters may not be longterm NT residents. In Queensland, renting numbers increased between the last two censuses in 20 of the 35 marginal electorates for which there is data available from both 2011 and 2016 (other electorates have been created since). In all but three, numbers have grown between 2006 and 2016. These numbers could be one reason why the Queensland government has flagged significant renting reform to come in 2019. In South Brisbane, rentals make up a solid 59.1% of dwellings, and numbers in Townsville, Cairns and Cook are nearing 50%. WA doesn’t fit the pattern – unlike every other jurisdiction, its share of properties that are rentals fell between 2011 and 2016 (from 29.2% to 28.3%). 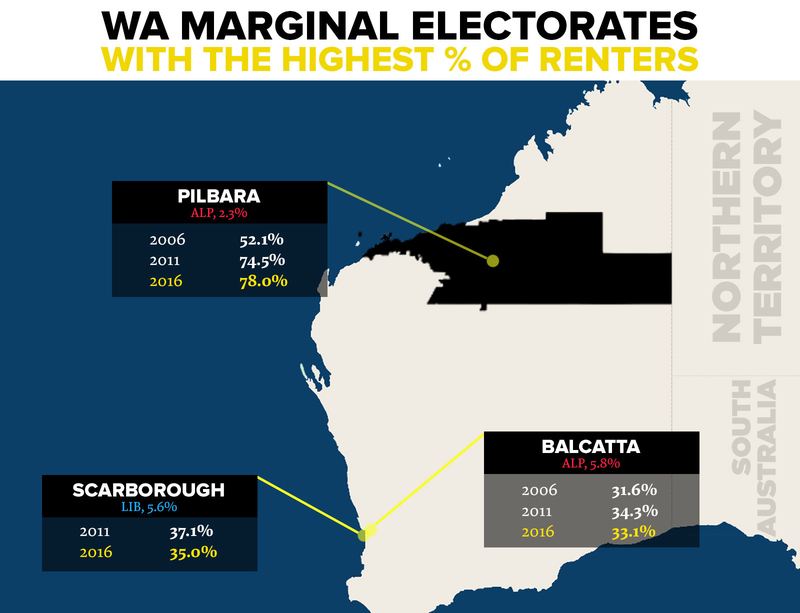 Renters make up a majority only in the electorate of Pilbara (78.0%), but are also above the national average in Scarborough (35.0%), Balcatta (34.3%), Mount Lawley (32.4%), and Geraldton (31.5%). 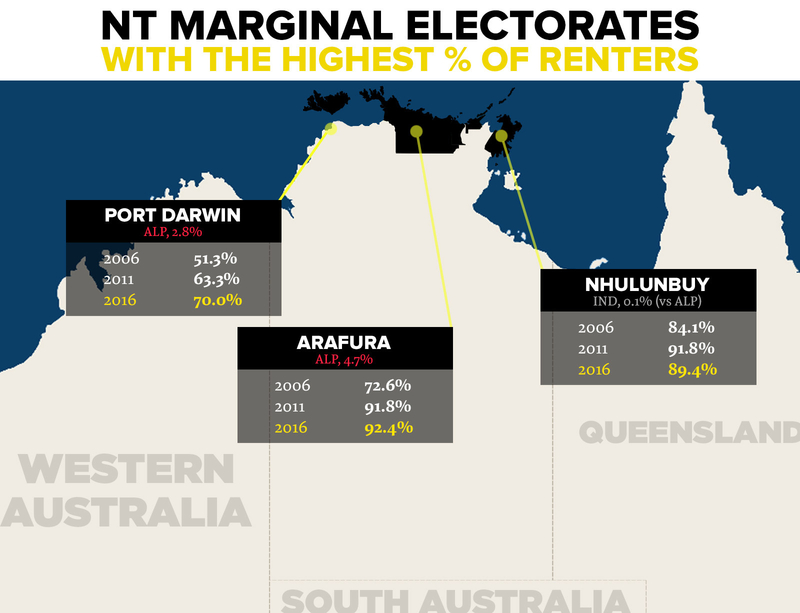 Renting numbers rose only in three marginal electorates between 2011 and 2016 (Kingsley, Pilbara and Riverton). SA has below average renting numbers, with 28.5% of its households reporting as rentals in 2016. But the numbers in marginal seats are generally increasing: 5 out of 7 marginal electorates for which there are data (three others were created in 2016) saw an increase in numbers between 2011 and 2016, and all increased between 2006 and 2016. The strongest concentrations are in the Adelaide seats of Adelaide (46.7%), Elder (38.6%) and Torrens (34.0%). Daniel Andrews’ Labor government in Victoria has delivered the most significant renting reform in the country in a package delivered just before campaigning kicked off for November’s election. Tellingly, that promise was made during the Northcote by-election, when Labor and the Greens faced off in a tight race. Northcote has seen an increase in rentals from 34.9% in 2006, to 37.9% in 2011, to 40.0% in 2016. 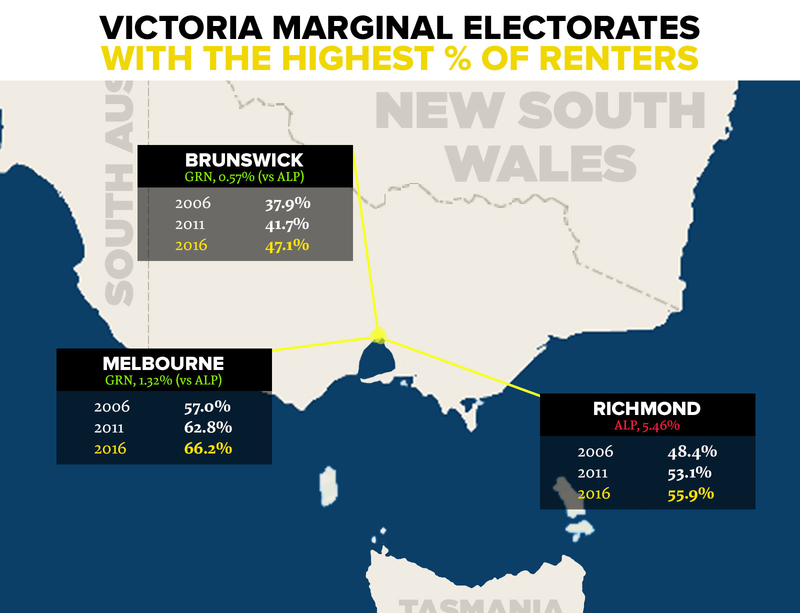 In two of Victoria’s 36 marginal seats – Melbourne and Richmond, both in the inner-city – renters now make up a majority. In 24 of the 32 marginal electorates that existed in both 2011 and 2016 (a 2013 redistribution created others), the proportion of renters increased in that five-year period. In all but two, the numbers increased between 2006 and 2016. In Brunswick, Bulleen, Brighton, Gembrook, Caulfield, the proportion of rental dwellings has increased between 2006 and 2016 by at least 7 percentage points. Tasmania and the ACT don’t have marginal seats in the same ways as the other jurisdictions. The ACT parliament only has one house, which uses a proportional representation voting system where multiple candidates are elected from five electorates. Tasmania uses that system in its lower house; while its upper house has single-member electorates, they don’t determine who forms government. That means we haven’t included Tasmania and the ACT here. Which 1D Album Should You Listen To Based On Your Fave Songs From Each Member?